Discussion in 'Disney Trip Reports' started by MeghanEmily, Jun 7, 2018. How dare you neglect us for school and practums and real like stuff Seriously though hope you are taking good care of yourself with so much going on. We'll be here when you get back. I remember all of that all too well. Hang in there! You'll make it! I really loved it too. I learned a lot and felt like I was making such a positive difference in peoples' lives. I just said this on my other TR to pkondz, but before this placement the elderly made me feel uncomfortable. Long-term care facilities felt like places out of creepy horror movies to me. I had so little experience with older adults, especially with chronic medical and degrenerative cognitive types of diagnoses. Even my own grandparents and great-grandparents all lived at home in relatively good health until they died of something fairly acute. And I'm super squeamish, so medical instability freaks me out. So I figured I'd hate it and I'd just have to get it over with. But it's turned out to be one of my favourite things I've done in my degree! The residents we're working with keep surprising me with what they're capable of when they're given the right supports. As I told pkondz: we worked with a gentleman with Parkinson's who could barely be understood by his wife or the staff most of the time because his speech had become so quiet and unintelligible, and by the end of our first session with him he was speaking clearly at a normal volume with a few reminders here and there. Pretty sure his wife's jaw hit the floor when we showed her. Right!? I need to get my priorities straight! Thanks, Kari! It's been very difficult, but I've got some good support and I'm getting to the point now where I can see the light at the end of the tunnel! It's all been really interesting, so I wouldn't change it if I could, but there's just been so much to do and so little time to get it done. Sleep, and exercise, and socializing have definitely suffered for a few weeks now. I'm looking forward to finding a better balance again soon. Just wanted to say hello, and to let you know that I haven't forgotten about you all! I have lost both myself, and all sense of time passing, while I've been completely immersed in my school term. During our second year of this program (where I am right now!) we have full class schedules, but we also take part in part-time clinical practicum opportunities. Usually they take place a few hours a week over the course of the whole term, but because of scheduling issues with the team at my site, we've had to condense our whole practicum into less than half the time, and we've been running off our feet! On a positive note though: I've learned that I actually really enjoy working with older adults in long-term care! Who knew!? I haven't had the chance to really read TRs or put together any updates in at least a month. (My sincere apologies that I haven't been responding to comments or keeping up with your stories!) But beginning in less than a week I'll be on a week-long study break and I hope to get back here for a few hours here and there to make up for lost time. It's nice to have a quick update from you, I know you've been very busy. I hope it's going well. I have to confess that I was actually in Halifax a couple weeks ago for a few days. I was thinking to drop you a note, but I knew you have a tight schedule, and I ended up having very little free time myself. But I may end up there a couple more times this year, so I will have to let you know. It would be nice to say hello and have a quick coffee. Hi Jeff! Wow—small world! (Great...now IASM will be stuck in my head all day...) Yes, please send me a message here or on FB if you're ever back in the area and have some free time! I hope you had a good stay. Terra Nova guy likes this. Hang in there! We’ll all still be here when time slows down again for a moment. This is amazing and so incredibly heartwarming. Makes all the hard work completely worth it to see someone's quality of life improve and know you had a hand in it. On a positive note though: I've learned that I actually really enjoy working with older adults in long-term care! Who knew!? If you ever want any tips from another Dr, I can ask my dad! He is a general practitioner, but specializes in long term care and geriatrics. He spends about half his work time travelling to nursing homes around the area and meeting with patients and their care teams. I know his opinion would be based on the US health system, but does know a lot about the Canadian system (his family is from BC) so could give some more insights! Thanks, Lesley! That's awesome—I'll keep that in mind! I'm finally caught up on this report. I'm really enjoying it. I would love to do the Epcot tour but I would also need to do it when I'm alone or maybe with Danielle. I love learning the history and secrets. Happy to hear your term is going well. Hang in there it will be more than worth it when you're done. Thanks, Vanessa! I hope you get a chance to try the tour sometime! I really enjoyed it! I'm actually taking Nathan to do it again this summer. StarWarsMomofGirls!, Steppesister, amazingact21 and 3 others like this. When I last left off...almost two months ago ...I had just finished up at Epcot after my UnDISCOVERed Future World tour, and I was on the way back to the hotel for a nap. I was feeling a little sluggish at the hotel after my busy morning, so I went on the MDE app and modified my dinner reservation for that night to be a little later. The good news was that I didn't have to rush back to the park, but the bad news was that the next latest reservation I could find was for 8:15, which made for a pretty late meal by my standards. After my nap, I headed to Magic Kingdom to spend the rest of my evening. My first stop was my FP for Splash Mountain. 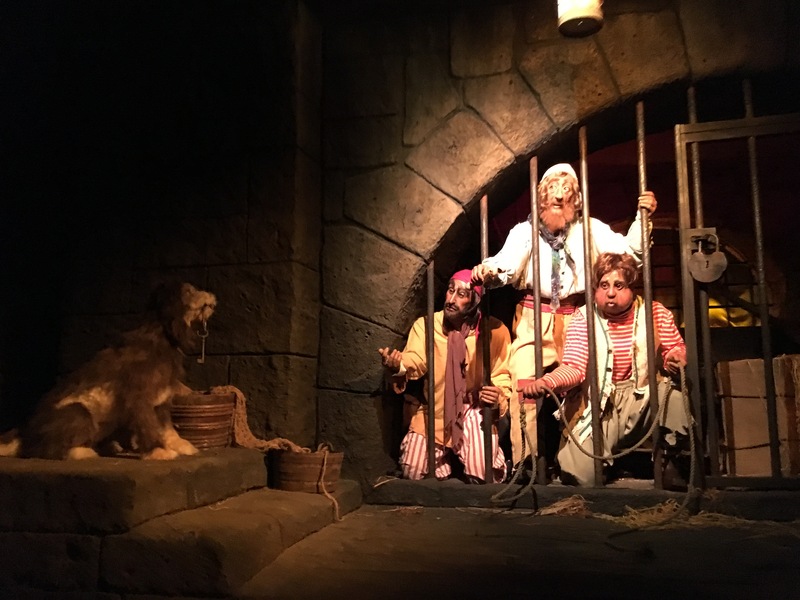 My next FP was for Big Thunder, but I was getting a headache, so I decided to do something a little less rough and change it to Pirates instead. 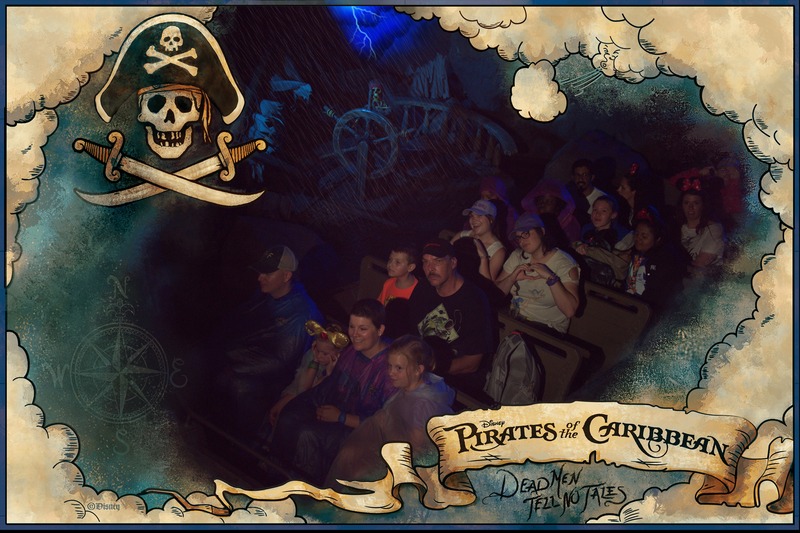 If you look very closely, you can barely see me in the back row of the boat pretending to be a pirate, complete with a @missjackiemcg-esque hook-hand and eye patch. The person in front of me ^ looks thrilled! 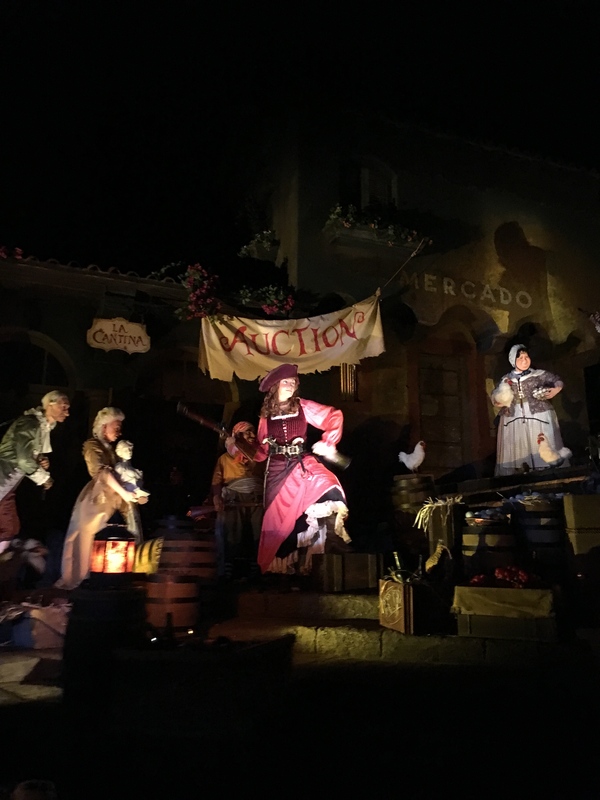 Everyone has their opinions now about "Redd" and the changes that have been made to the ride. (That was still pretty fresh when this trip took place!) I tend to keep mine mostly to myself, or at least I keep them short and sweet. I am sad for the piece of Disney history that was lost in terms of some of the original voice actors' recordings. But I think new and improved Redd is a super cool chick, and I like that Disney doesn't think it's cool anymore to perpetuate the selling of women. 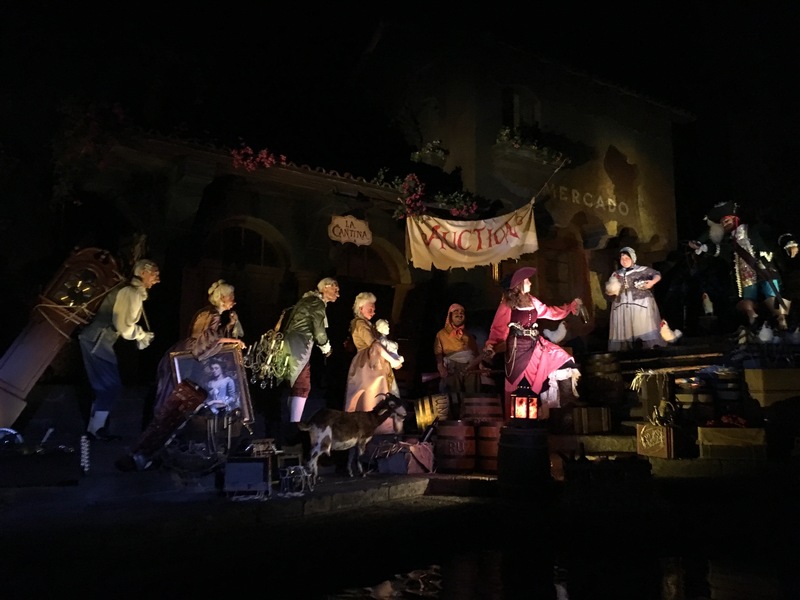 After my pirate voyage, it was almost time for my now-later dinner ADR at Skipper Canteen, so I went to check in. 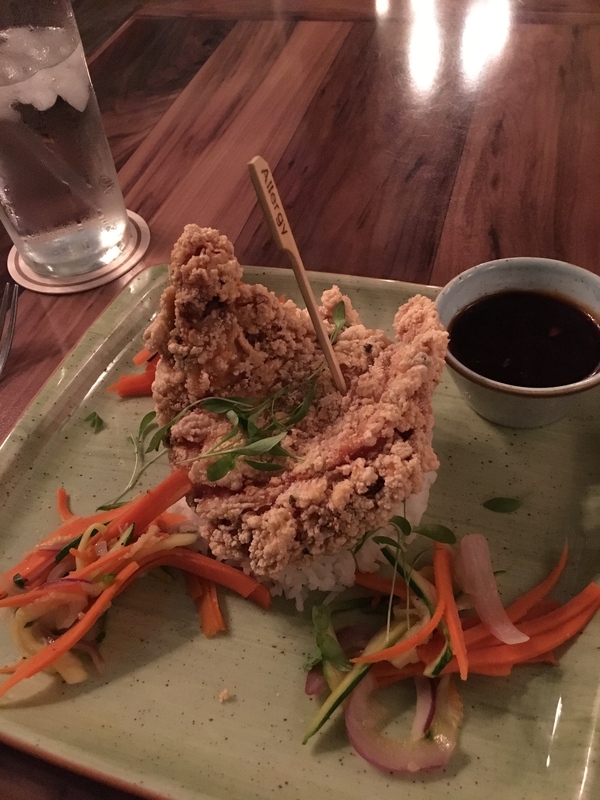 I ordered one of my favourites, the Tastes Like Chicken, because it's a novelty for me to be able to order a gluten free version of anything resembling fried chicken. It didn't disappoint. I was a little nervous about going to this ADR as a solo diner because I thought it might be awkward with all the corny jokes, or I thought my skipper wouldn't take much time with me. I was pleasantly surprised to find that my skipper, Jared, was totally on his game and treated me just as well as if I'd been there with a group! His jokes were on point, and he was super attentive without hovering. 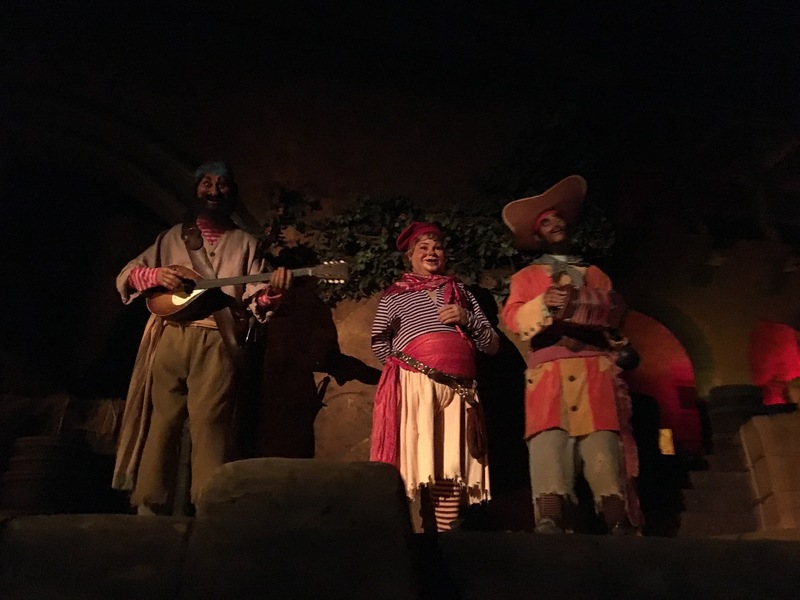 I sent a cast compliment out after I left thanking Skipper Jared for making me feel totally comfortable as a solo diner and making my meal so much fun. It had been a short night in the Magic Kingdom, but I was still feeling a little tired and headachy, so I decided to make my way out early and get on a bus before the nighttime rush. On my way out, Happily Ever After had just begun, so I listened a bit and watched a few fireworks go off over the train station, before heading out to the busses and getting on my way ahead of the crowd. kastoney, StarWarsMomofGirls!, paradesintherain and 3 others like this. 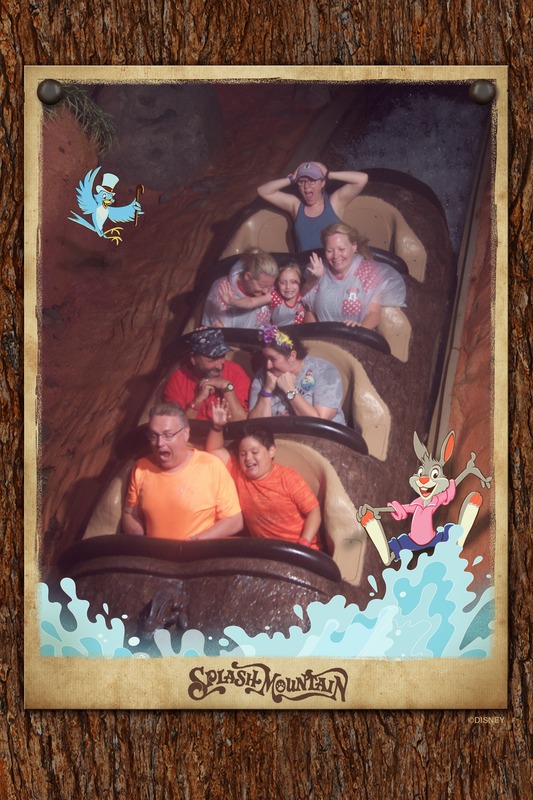 Love your Splash ride photo! If you didn't tell us the story it would look like you just planned it that way! I once lost my favorite hat on a boat- I know all too well how you would feel if you lost yours!! I'm glad you had a great meal at Skipper Canteen! Ohhh that's a nice pic of the train station with the fireworks in the background! I'm sorry, who are you again? the bad news was that the next latest reservation I could find was for 8:15, which made for a pretty late meal by my standards. By mine too. Just out of curiosity, what time do you shoot for? I can see why you'd hold on for dear life! But I'm kinda chuckling at the poncho wearers. complete with a @missjackiemcg-esque hook-hand and eye patch. So that's what you were doing! Durr… is this a pirate ride? Everyone has their opinions now about "Redd"
I am sad for the piece of Disney history that was lost in terms of some of the original voice actors' recordings. But I think new and improved Redd is a super cool chick, and I like that Disney doesn't think it's cool anymore to perpetuate the selling of women. See that's just it. I don't feel that way. Maybe because I'm not a woman, but... it's very tongue in cheek. Then again, they changed the men chasing the women to the women chasing the men on the ride a long time ago. It works. Until enough people complain that it shows someone chasing... someone. Can't have that? I think I'll stop talking now. I ordered one of my favourites, the Tastes Like Chicken, because it's a novelty for me to be able to order a gluten free version of anything resembling fried chicken. It didn't disappoint. I was a little nervous about going to this ADR as a solo diner because I thought it might be awkward with all the corny jokes, or I thought my skipper wouldn't take much time with me. I was pleasantly surprised to find that my skipper, Jared, was totally on his game and treated me just as well as if I'd been there with a group! Glad to hear. I had a very similar experience when I went solo. Sorry to hear that. Hoping the next day you were feeling a bit better. Thanks!! Favourite hats are very important! Thanks for not giving up on me! Ideal dinner time is any time between 5:30-6:30 for me. I aim for a 6pm ADR often. But that said, I actually have a lot of later (i.e. after 7:30pm) reservations booked now for our August trip because of how they fit into the schedule, or trying to overlap with fireworks, etc. I'd like to argue that it is, indeed, because you're not a woman, but even so I know there are many many women who would agree with you, so it's not only that. I do, however, think that the way women are impacted by something like this is different from men, just like the way Indigenous people in Canada are impacted by racist attitudes or jokes is different from how I would be. I certainly don't fault you for not agreeing with me. It would be unrealistic, and honestly probably quite boring, for friends to share all the same opinions all the time. For me, as much as I recognize the value of history and tradition, I also like shaking things up if it means that it helps even the playing field. My mantra as of late, paraphrased from Maya Angelou, is that when we know better we do better. Some people might say it's silly or being walked all over, and that the danger in having to bow to the whim of every person who gets offended about every little thing is that it becomes a slippery slope, etc. I can understand where this comes from. I'm still more of the opinion that there's a lot of injustice in the world, and in the scheme of things it doesn't hurt us any to do what we can to make the world a kinder and more understanding place for people from traditionally marginalized groups who are most negatively affected. Quite fortunately, I have never been sold at an auction! (Though the fact that selling human beings is still a thing is pretty shocking to me.) But I have had experiences where another person felt that they were entitled to treat my body in a way I didn't consent to, which isn't cool, and historically that has definitely happen more often to women than to men. In the end, I feel like it comes down to the whole society-is-obsessed-with-being-PC kinda issue, which I predict we might also disagree on at least to an extent. I could go on and on, but I'll leave it there for now. But the fact that Disney can spark these kinds of respectful discussions and disagreements between friends, in and of itself, is kind of interesting. The "Tastes Like Chicken Because It Is!" So...hopefully that means it really is chicken. Though I always make the mistake of calling it the "I Can't Believe It's Not Chicken" which usually results in the skipper making fun of me. You think I'd learn! Thank you! My notes don't give much indication, but I seem to recall that the next day wasn't perfect, but that it was definitely better. 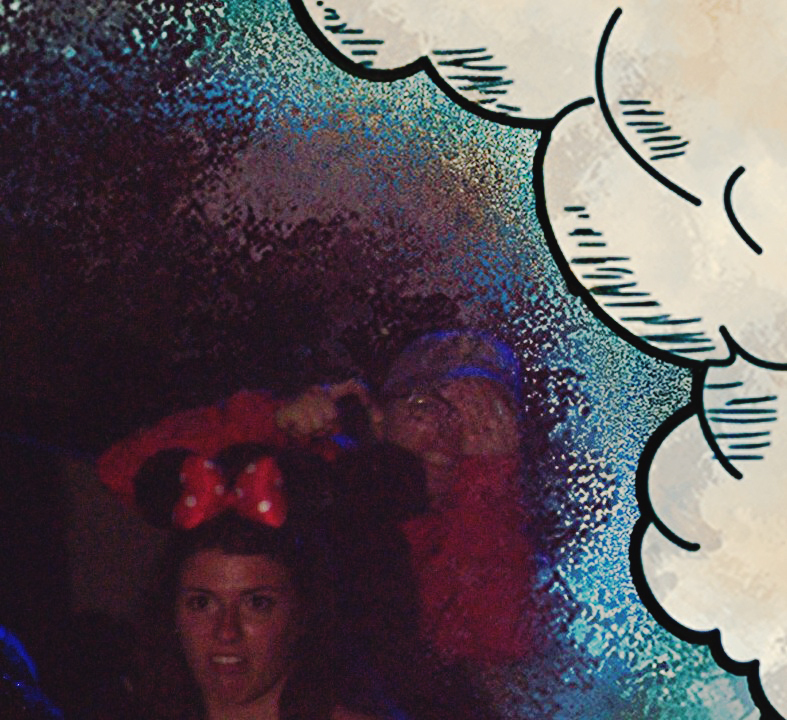 Your Splash Mountain ride photo is great. Everyone on your boat had priceless reactions! I was struggling to find you in the Pirates photo until you told me where you were! Your picture from the train station is fantastic. 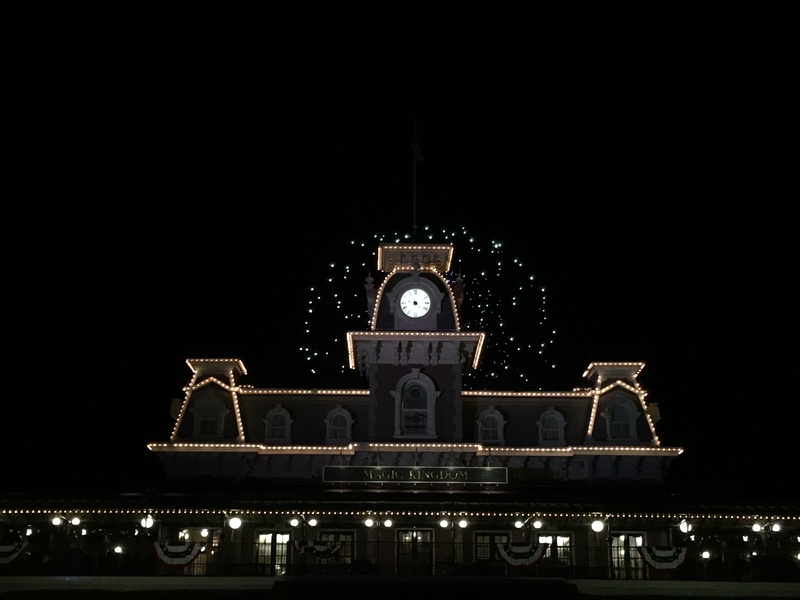 The fireworks going off behind the station look perfect and instantly reminded me how special the MK at night can be. Thanks! Isn't it cool how a picture can put you right back in a special memory or feeling? That's one of the things I love about reading trip reports is how seeing other people's photos can give me "feels" and remind me what it's like to be there. Ah! I try to aim for that same time slot. I have... well, friends through a relative... distant friends?... who regularly eat dinner around 10pm. Not sure how they're able to sleep after that! I'd like to argue that it is, indeed, because you're not a woman, but even so I know there are many many women who would agree with you, so it's not only that. Agreed. I know several women who are not happy about the change. At all. Heck, some women are more upset about it than I am. I think my feelings are summed up by... "Darn... Oh, well, whatever. I'm still at Disney!" I would prefer that it hadn't changed... but I'm not caring about it enough to be up nights or anything. I certainly don't fault you for not agreeing with me. And yet... we kinda are. It would be unrealistic, and honestly probably quite boring, for friends to share all the same opinions all the time. Yes! Agreed! There'd be zero conversations. "So... what do you think of ____ ?" "Same as you." "Oh." My mantra as of late, paraphrased from Maya Angelou, is that when we know better we do better. The question was asked about grief. When to say something and when to not... but it applies in many situations. Err on the side of kindness. Some people might say it's silly or being walked all over, and that the danger in having to bow to the whim of every person who gets offended about every little thing is that it becomes a slippery slope, etc. Yes. That is what I'm afraid of. When does it stop? When the entire world is bland and grey? When everyone is so offended about offending... anyone... that no one says or does anything out of fear of slipping down that slope? Quite fortunately, I have never been sold at an auction! Well, of course not. Who could afford you? You're priceless! I know. And very, very common. That really ticks me off. I'm sorry that happened... and I have no doubt you're experience is extremely common. and historically that has definitely happen more often to women than to men. In the end, I feel like it comes down to the whole society-is-obsessed-with-being-PC kinda issue, which I predict we might also disagree on at least to an extent. I suspect we would too. I'm an old fart stuck in his ways, you know. But the fact that Disney can spark these kinds of respectful discussions and disagreements between friends, in and of itself, is kind of interesting. And that's a very good thing, I think. I can't imagine. When I visited Italy, the family I stayed with ate around 9pm. I know it's pretty common, but doesn't work well for me. I think that's a pretty healthy approach. After all, it's one ride. I mostly keep that in mind, too. Definitely lots of common ground! Maybe they call it "common" ground because you can find it more often than one might think. I suspected so. I can definitely understand this. It's a tricky situation...one for which I don't have a perfect answer. Thanks. I think you're right that it is, indeed, common! And probably has been common for a long time. But the more people talk about it, the more people talk about it, if that makes sense! Aahhhh that makes sense! I wondered who was making this TR smell so funny!